↑ Munroe, Randall (February 7, 2007). "Philosophy". 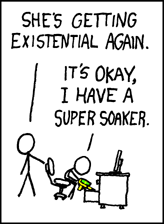 xkcd. Retrieved February 26, 2016. ↑ Chivers, Tom (November 6, 2009). "The 10 best webcomics, from Achewood to XKCD". The Telegraph. Retrieved December 7, 2015. ↑ Munroe, Randall (September 11, 2010). "About xkcd". xkcd. Retrieved December 4, 2014.